Smoke damage following a fire leaves a sticky, tar-like coating and an unpleasant, lingering odor on everything. Unlike fire damaged materials, smoke damage is another matter altogether. 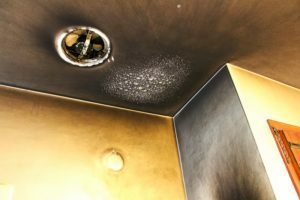 There are varied opinions from restoration professionals as to what is the most effective way of getting rid of smoke damage in Kansas City. A professional remediation service is suggested when your property has sustained smoke damage. At AAS Restoration and Roofing, our specially trained staff provides high-quality service to every customer. When your home experiences a fire, the damage may extend beyond the structure itself, impacting the contents within your home. In a situation where your personal property has been affected, we inspect, pack out and clean your personal belongings, restoring them to their pre-loss condition during the process. There are several critical steps that must be taken and it’s important that restoration efforts begin as soon as possible in order to lessen the amount of smoke damage. According to the IICRC Standards, acid soot residues can cause permanent damage if left untreated. As most fire restoration professionals can tell you, every fire has different characteristics and the smoke damage is specific to the type of fire. For example, the dry smoke residue that results from a high-oxygen fire is usually easier to remove than wet smoke damage caused by a low-oxygen fire. Additionally, when water is used to extinguish a fire, it causes the wood in the property to expand and it absorbs even more residue and smoke damage. Fires generate caustic, highly corrosive smoke damage that with time can invade and ruin just about anything. Burning plastics, leather, wood and other materials cause toxic smoke that determines the appropriate restoration procedures. Wearing dust masks and heavy gloves, and ventilating the building, are standard safety precautions for the remediation process of smoke damage. Getting rid of the sight of smoke damage is a fairly simple process, you can clean it, paint over it or remove the contents. The smoke odor is invisible and even more intrusive and requires specific treatment. AAS Restoration is experienced in completely eliminating the odor from smoke damage in your Kansas City home. How the clean up after smoke damage is done makes all the difference. Using the proper method is as important as how quickly it is done. When done incorrectly, the odor can linger in a house forever. Removing items that are beyond repair must be carried out as soon as possible. Also, having some items cleaned and deodorized offsite will mitigate a lot of the odor. AAS Restoration in Kansas City will clean and deodorize all smoke damaged clothing, furniture, upholstery, artwork, electronics and heirlooms, using the Esporta Wash System for your textiles and soft goods and the Fireline System for Deodorization and odor modification. Your home will be thoroughly cleaned and sealed to prevent odor from re-entering your home. The Esporta Wash System is a wet-wash machine designed exclusively to recover soft contents damaged in fire and water disasters. It is five times more effective than traditional front-loading washing machines, eliminating 99.9997% of contaminants, including heavy smoke, soot, mold, and sewage. Soft contents include goods such as footwear, linens, outerwear, leathers, bedding, outdoor items, athletic equipment, survival gear, sleeping bags, life jackets, stuffed toys, and personal clothing. The patented wash system breaks down unwanted organic materials and kills bacteria, viruses, and mold spores on contact. The system also removes organic and inorganic contaminants without degrading or damaging the materials. AAS Restoration is the only licensed vendor of the Esporta Wash System for smoke damage in Kansas City. We are a disaster restoration company that is experienced at smoke damage restoration. We’re here when you need us! Give us a call if your home needs smoke damage repair and restoration.